As a test team India was debuted in 1932 in international cricket, when Indian cricket team had visited England in the captaincy of Maharaja of Porbandar. The only Test match played between the two teams on 25-28th June, 1932, in which C.K. Naidu was the captain of Indian team. In this article, we are giving details of the members of the first Indian Test cricket team. At the present time, cricket has become an important source of entertainment in India. Also, due to the increasing popularity of this game, it has become one of the most played and seen sports in India. As a test team India was debuted in 1932 in international cricket, when Indian cricket team had visited England in the captaincy of Maharaja of Porbandar. The only Test match played between the two teams on 25-28th June, 1932, in which C.K. Naidu was the captain of Indian team. In this article, we are giving details of the members of the first Indian Test cricket team. Born on 4th December, 1910 in Rajkot, Amar Singh Lodha was a right-arm medium pacer and lower-order batsman. 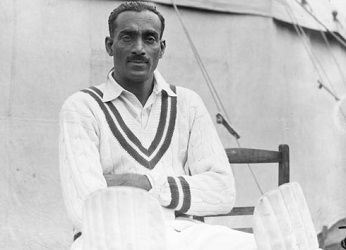 Amar Singh had played 7 Test matches for India from 1932 to 1936. He was India's first fast bowler and all-rounder. He was the first Indian to get a Test cap. Apart from this, he was the first Indian who scored fifty in Test cricket. He passed away on 21st May, 1940 at the age of 29 in Jamnagar (Gujarat). Born on 22nd September, 1902 in Mumbai, Sorabji Colah was a right-handed batsman. 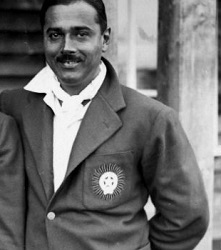 Sorabji Colah had played two Test matches for India from 1932 to 1933. In addition, he also played against the Australian Service XI in 1935 and Lord Tenson’s team in 1937. He represented Western India and Nabinagar in Ranji Trophy and also was the captain of Parsis in Bombay Pentangular. He passed away on 11th September, 1950 at 47 in Ahmedabad (Gujarat). Born on 1st February, 1910 in Jalandhar (Punjab), Mohammed Jahangir Khan was a right arm medium pacer and right-handed batsman. 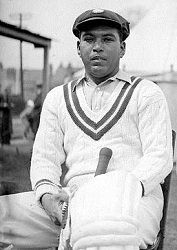 Mohammad Jahangir Khan had played 4 Test matches for India from 1932 to 1936. He worked as a national selector in 1939-40 and 1941-42. After independence in 1947, he went to Pakistan and worked as a cricket administrator. Jahangir Khan's son Majid Khan and grandson Bazid Khan had represented Pakistan cricket team. He died on 23rd July, 1988 at the age of 78 in Lahore. Born on 16th December, 1909 in Kuala Lumpur (Malaysia), Lall Singh was a right-handed batsman and right arm slow bowler. Lal Singh had played only one Test match for India. 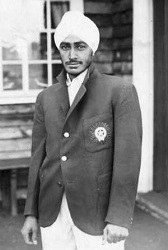 He was the first Sikh who played Test match for India. He was very aggressive batsman and his defence was quite uncertain. He passed away on 19th November, 1985 at the age of 75 in Kuala Lumpur (Malaysia). Born on 17th April, 1904 in Karachi, Naoomal Jeoomal was a right-handed batsman and right arm leg break bowler. 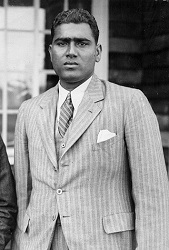 Naoomal Jeoomal had played three Test matches for India from 1932 to 1934. He was India's first opening batsman, whose playing style was defensive. In the late 50s, Naoomal Jeoomal worked as coach of Pakistan Cricket team and in 1957 as a national selector. In 1971, he settled in India. He died on 28th July, 1980 at the age of 76 in Mumbai. Born on 7th December, 1902 in Fulgaon (Maharashtra), Janardan Navle was a right-handed wicket-keeper batsman. He was the first wicket-keeper batsman who played for India. 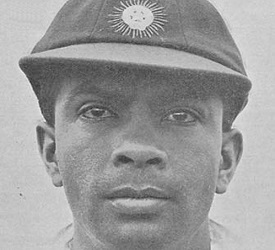 Janardan Navle had played two Test matches for India from 1932 to 1933. He faced the first ball as India's first opening batsman. After retired from cricket, Janardan Navale also worked as a security guard in a sugar mill in Pune. He died on 7th September, 1979 at the age of 76 in Pune. Born on 31st October, 1895 in Nagpur (Maharashtra) C.K. Naidu was a right-handed batsman and right arm slow bowler. He was the first captain of Indian Test cricket team. C.K. 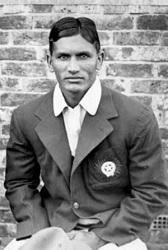 Naidu had played 7 Test matches for India from 1932 to 1936. C.K. 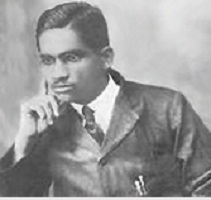 Naidu was the first cricketer of India who had advertised for a brand (Bathgate Liver Tonic in 1941). In 1956, the Government of India was honoured C. K. Naidu with Padma Bhushan (second highest civilian honour of that time), third highest civilian honour. In 1923, C.K. Naidu was honoured with the title of Colonel by the ruler of Holkar, since then he became famous as Colonel C.K. Naidu. He passed away on 14th November, 1967 at 72 years of age in Indore. Born on 8th June, 1906 in Jalandhar (Punjab), Nazir Ali was an aggressive batsman, right arm medium pacer and a good fielder. Nazir Ali played two Test matches for India from 1932 to 1934. After India's independence in 1947, Nazir Ali went to Pakistan and worked as an administrative officer. He passed away on 18th February 1975 at the age of 68 in Lahore. Born on 1st August 1910, in Hoshiarpur (Punjab), Mohammad Nissar was a right-handed batsman and right-arm fast bowler. He is considered as India's fastest bowler before independence. According to India's first Test captain C K Naidu, the speed of ball delivered by Mohammed Nissar in the first match played between India and England in 1932 was faster than English bowler Harold Larwood who trouble Australian team in the 1932s famous bodyline series. The pair of Mohammad Nissar and Amar Singh was considered to be most dangerous fast bowlers pairs in the 1930s. 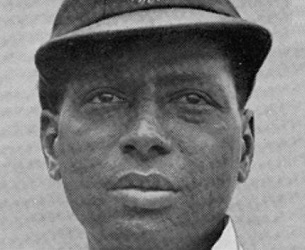 Mohammad Nissar took part in 6 Test matches for India from 1932 to 1936. After India's independence in 1947, Mohammed Nissar went to Pakistan. He passed away on 11th March 1963 at the age of 52 in Lahore. Born on 5th September 1910 in Mumbai, Phiroze Palia was a left-handed batsman and slow left arm bowler. 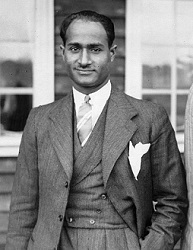 Feroz Palia took part in two Test matches for India from 1932 to 1936. After retiring from cricket, Phiroze Palia started furniture business in Bangalore. He died on 9th September, 1981 in Bangalore, at the age of 71. Born on 15th September, 1903 in Jalandhar (Punjab), Wazir Ali was a right-handed batsman and right-arm medium pacer. 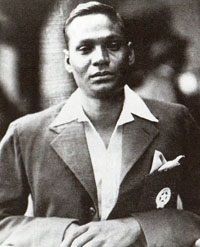 Wazir Ali took part in 7 Test matches for India from 1932 to 1936. Wazir Ali took part in all Test matches played by India before World War II. In the two non-official test matches played against Australia XI in 1935-36, Wazir Ali was the captain of Indian cricket team. Wazir Ali was the elder brother of Nazir Ali, who was also a member of Indian team. Wazir Ali went to Pakistan after India's independence in 1947. He died on 17th June 1950 at the age of 46 in Karachi. Previous Story What is the role of Helium in Medicines?